Jimoh Ighodalo is a Nigerian master-sculptor with over 50 years of experience in carving large scale wood works. Ighodalo currently resides in Ibadan, Nigeria where he operates a studio and gallery showcasing works of art that highlight traditional African culture. 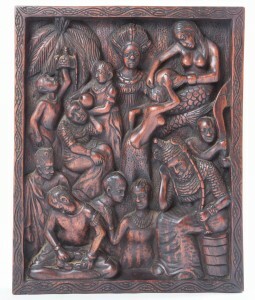 His style of work can be traced to the sophisticated arts of the Benin Kingdom in West Africa. 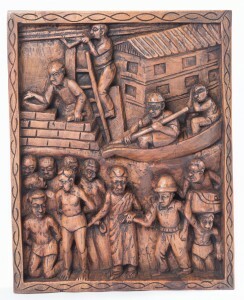 By carving intricate figures into wood, Ighodalo illustrates historical references used to retain oral traditions. Many of his pieces depict a combination of both facts and myths concerning tales associated with his hometown. Sculptures by Ighodalo have been exhibited and collected throughout Nigeria, the United Kingdom and the United States. Through his commitment to traditional themes and styles, Jimoh Ighodalo offers cultural preservation in an attempt to remember our past. 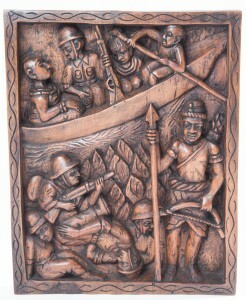 Asoro (15.7×19.7); A Benin warrior credited with defending the kingdom against British invasion. Eze Ego (15.5×19.2); Eastern traditions and the attachment to wealth. Pot of Life (16×19.8); The story of the “Oba” of Benin and how a special spirit healed him during illness. 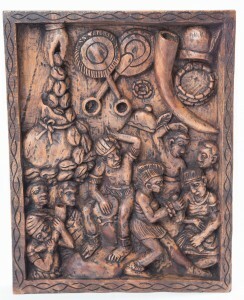 Slavery (15.6×19.7); Depicts the voyage from Africa to nation-building in the Americas.